After parts of the Danish capital turned into a battlefield, Copenhagen Police have banned right-wing demonstrations as a "threat to public safety" and established temporary double punishment zones, the Danish Jyllands-Posten newspaper reported. Copenhagen Police have confirmed that an object resembling a hand grenade was found at the Blågård Plads square in Copenhagen's Nørrebro district, which earlier became an arena for violent immigrant riots following right-wing protests. "We have found an object that looks like a hand grenade", the police tweeted. Bomb disposal units from the Danish military searched the location for other explosives. Politiet har tirsdag afspærret Blågårds plads mens de undersøger mistænkeligt forhold. — presse fotos (@pressefotosdk) 16 апреля 2019 г. 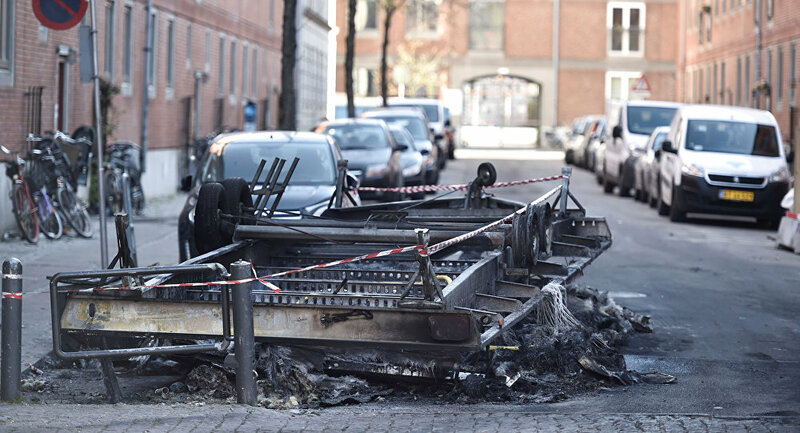 ​Located in a bustling part of Nørrebro, the square became the location of an attempted Quran-burning demonstration by the right-wing Stram Kurs ("Hard Line") Party led by Rasmus Paludan. While Paludan was escorted from the scene following an attack from counter-demonstrators, riots featuring street fires, skirmishes with the police and stone throwing later broke out. At least 23 people were arrested. As Stram Kurs planned a new demonstration at the same location on Tuesday, Copenhagen Police tweeted that permission for such a demonstration has been withdrawn as it "would present a threat to public peace". In a subsequent statement, Copenhagen Police announced a ban on Paludan's demonstrations in parts of the city until 23 April. The ban would be continually reviewed and lifted "as soon as there is no longer a risk to public order", the police said in a statement. Later, a 19-year-old was arrested on suspicion of firearms possession, placing the hand grenade, and writing "Death to Paludan", the Berlingske newspaper reported. Meanwhile, Copenhagen Police deployed extra patrol officers in Nørrebro following the recent days' unrest. Part of the action involves informing young people in the area about Danish legislation and the freedom of expression. "What we believe is that they don't understand that one is allowed to violate their religion and profane the Quran", Chief Police Inspector Jørgen Bergen Skov told Jyllands-Posten. As another measure, temporary double punishment zones were introduced in the capital, including districts such as Nørrebro, Tingbjerg, parts of which are notoriously present on Denmark's official "ghetto list". "It is our estimation that an extraordinary crime situation has taken form in several areas of Copenhagen's police sectors — one that generates insecurity for residents and others moving about in the affected areas", Skov said. The decision to stop demonstrations by Stram Kurs was met with mixed reactions from Danish politicians. While some supported the ban, others saw an encroachment on the freedom of speech. "You can't forbid Paludan to demonstrate in the long run. The thing is that you need is a good reason for rejecting a demonstration", Peter Kofod of the Danish People's Party said, arguing that freedom of speech has been under pressure in recent days. "I think it's a disgrace that attitudes that you don't like are met with violence instead of counter-arguments. Freedom of speech also includes attitudes that most people disagree with", Christina Egelund of the Liberal Alliance said. Stram Kurs is a fringe party that identifies as "ethno-nationalist utilitarians", "libertarians" and "Danish patriots". Despite only being founded in 2017 and having only a limited membership, the party repeatedly makes headlines in Denmark with its protests, which involve symbolic Quran-burnings made possible after the repealing of Denmark's centuries-old blasphemy law.